On Wednesday, November 2nd, in the aula of the General Congregation, Fr. Arturo Sosa wanted to meet with the lay people who work in the General Curia of the Society of Jesus. They were some fifty members of the staff who work daily, side by side, with the Jesuits in various positions: administrators, information technology professionals, secretaries, cooks, cleaners, gardeners and other employees. It is a tradition that the General meets with his co-workers soon after the end of a General Congregation. Unexpectedly, Fr. Sosa wanted to meet them in the course of the congregation. Immediately after the event, we collected the warm testimonials to some participants. Here are those we received in English. On Wednesday 2 November, the Feast of All Souls, in the Aula of the General Congregation, Father General Arturo Sosa met with the lay people who work alongside the Jesuit community at the Curia of the Society of Jesus in Rome. 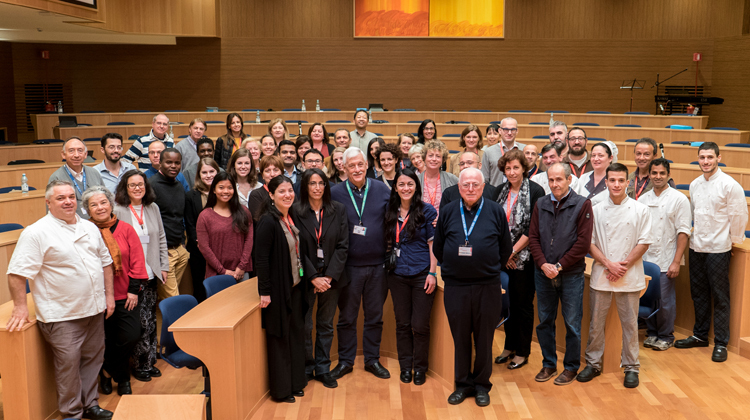 These lay colleagues work in many and varied capacities, from administrators and Information Technology professionals, to cooks, cleaners and gardeners, in the Jesuit Refugee Service, the Roman Jesuit Archives and Library, and many other roles in service of the worldwide Society.